This year, we are so pleased to welcome Marcella Kanfer Rolnick as the speaker at our November 16th Dinner Forum. Marcella is a third-generation Vice Chair at GOJO Industries, Inc., the inventors of PURELL Hand Sanitizer. 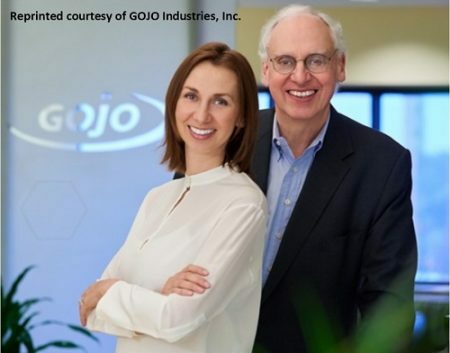 The GOJO Purpose of Saving Lives and Making Life Better Through Well-Being Solutions drives every decision their Family Enterprise makes, from the products they create, to the ways they work. GOJO has changed how the world stays well for more than 70 years. Follow the link above for Marcella and you will read about the many accomplishments and awards of her career. In February, BrownFlynn.com recognized her as one of the nation’s most accomplished, uplifting women business leaders. In her professional role, Marcella focuses on creating meaning and value. At GOJO, Marcella ensures preconditions for the company’s long-term viability and vitality are in place. As a result, this includes her championship of sustainability, innovation, and organizational effectiveness. Furthermore, authenticity is a key component of how Marcella functions. At work and at home, she is an uplifting leader. “When you’re making any decision, ask yourself, ‘What do I really want to impact and what?’ Be thoughtful about your influence, and most of all, be authentic.” Click here to read the entire article. Register today to join us on November 16th and hear more of her story! Marcella will share about their family’s unique family business model. The model allows each family member to work on his or her preferred venture, while still being a part of the family business. In addition, she will also discuss how their family engages by actively being in partnership across generations, and how she encourages her fellow team members to seek possibilities to make the world better.